Some pranks are fun to play with and would appeal to all age groups. However, the onus remains on you, the prankster himself, to make sure that your ‘victim’ is carefully chosen as sometimes, there are things that could end up going the wrong way. 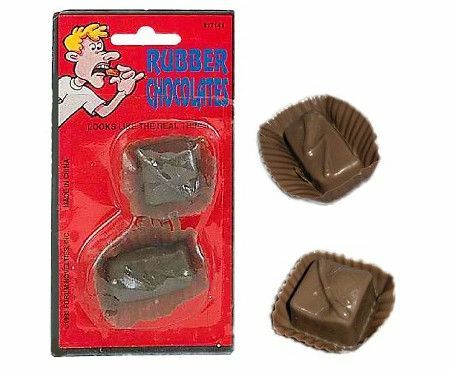 Case in point, with the $3.99 Rubber Chocolates Prank, you can never quite tell just when your chosen ‘victim’ could end up choking on it by accident, so it would be best if you were to prepare yourself and be equipped with the knowledge of performing the Heimlich maneuver. Imagine a party where you have a tray of chocolates all laid out, and you decide to drop a couple of these Rubber Chocolates on said tray. Just in case you are correctly singled out as the prankster, just tell them that you are saving them the trouble of stocking up on unwanted calories.